Diamond and pink sapphire half eternity ring, featuring 0.27cts of diamonds, 0.33cts of pink sapphires in a channel set 3mm ring. 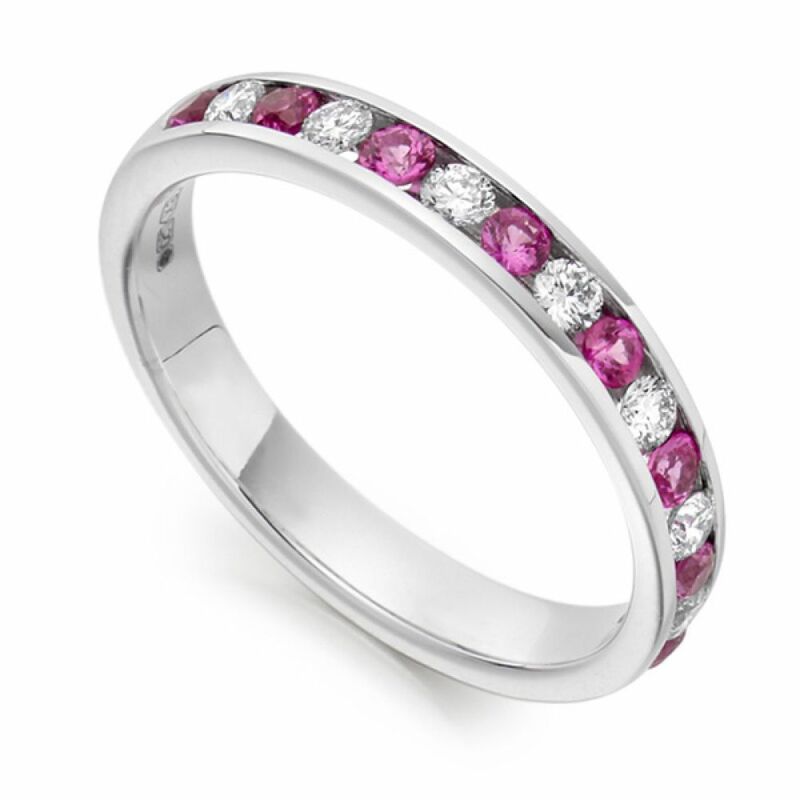 A beautifully feminine design, this half set Eternity Ring features a total of 0.27cts of Round Brilliant cut Diamonds alternating with a total of 0.33cts of pink Sapphires in a channel setting. Each Diamond within the design has been graded F Colour and VS1 Clarity, prior to being precision set alongside the pink Sapphires into the channel of the band. The Eternity Ring itself is a 3mm court profile band, both comfortable and traditional. We can craft your Eternity Ring for you in either 18ct Yellow Gold, 18ct White Gold, 18ct Rose Gold, Platinum or Palladium. Once we have crafted your ring in your desired precious metal, it will be delivered straight to your door by a secure courier, presented in our luxury Serendipity Diamonds packaging.